218 pages | 45 B/W Illus. 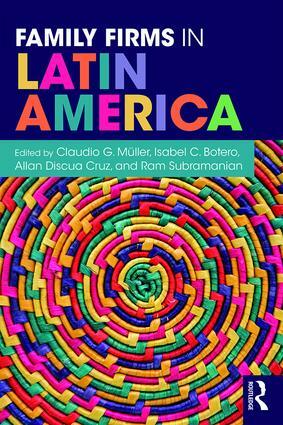 This is one of the first books of its kind to highlight family firms in a Latin American context, helping students to understand the distinctive nature and challenges of Latin American family businesses and how these issues compare to family businesses around the world. Building on their experience in teaching, research, speaking, and consulting on the subject of family firms in Latin America, the editors explain the need to implement and adapt traditional frameworks in the changing Latin American reality. Each section provides background on the most important topics in the management of family firms, including strategy, entrepreneurship, and performance, followed by illustrative cases and a discussion of how this knowledge is similar to or different from other parts of the world. The book’s clear writing and in-depth approach will appeal to undergraduate and graduate students of international business, business in Latin America, and family business. Claudio G. Müller is a Professor of Management at the School of Economics and Business at Universidad de Chile, Chile. Isabel C. Botero is an Assistant Professor of Entrepreneurship and Family Enterprise at Stetson University, USA. Allan Discua Cruz is a Lecturer in Entrepreneurship at the Department of Entrepreneurship, Strategy, and Innovation (DESI) at Lancaster University Management School, UK. Ram Subramanian is Professor of Leadership at Stetson University, USA.